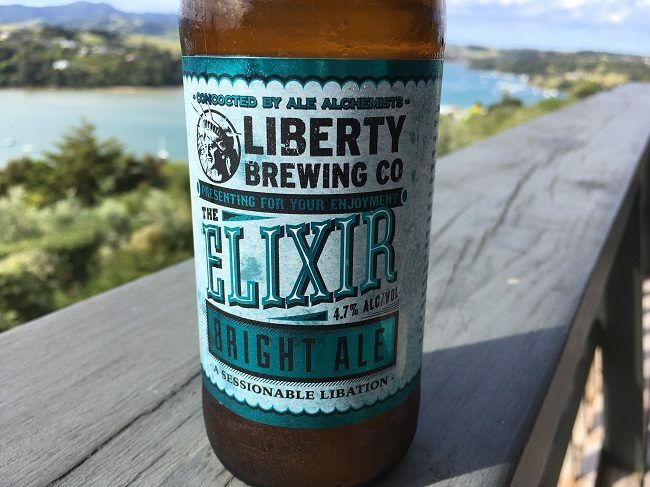 I picked up an ‘Elixer Sixer’ at a liquor store at Snells Beach, north of Auckland. I was looking for a bright, light, thirst-quenching beer to enjoy on a magnificently positioned balcony, high above picturesque Sandspit. What I got was all that, and so much more. Blurb on the bottle: Elixir Bright Ale has in addition to its valuable qualities as a thirst quenching beverage, mystical properties that act mildly on the nub ends of one’s tongue sending peachy tropical signals to the grey matter, which highly commend it; and yet these properties are in no way indicative of taking medicine. Every mouthful of this delicious beverage is prepared under the personal supervision of Mr Joseph Wood Esquire, The First. It is comprised of the finest selected domestic malts and hand plucked Amarillo and Nelson Sauvin hops. Tastes like: I don’t know about all this snake oil talk (see blurb on the bottle), but Liberty Brewing Co.’s ‘The Elixer’ tastes like summer in a bottle. It’s bright and light, extremely pale ale, with notes of peach, orange, and lemon curd. The Elixer has a crisp, medium-bitter finish – especially when you get to the end of the bottle. It’s lucky I have five more, then. The verdict: The Elixer by Liberty Brewing won’t set the world on fire in terms of unrelenting hop power, but it just might be thirst quenching enough that it could put a big fire like that out. In other words, this is the beer you turn to when you just want something nice and easy-going. It’d be my pick so far for summer 2017-18. Beer/movie combination: Star Wars: The Last Jedi. That’s the only movie that matters at this present moment in time, right? It’s certainly the only movie out this month that’s worth talking about. I’m trying to forget all about ever going to see Justice League, and I’m definitely not about to rush out and see Daddy’s Home 2.